When in the throes of designing and organizing a new building, I am often struck with the notion that I am creating a map. Turns out there is an active debate on the subject: Graeme Martin of Spacial Vision covers the tip of the iceberg in BIM, CAD and GIS – what’s in a name? and cross references Dr. Anne Kemp's white paper “BIM isn’t Geospatial” …. Or is it?" Is a Building Information Model, as produced in Revit, a small scale version of a Geographic Information System? Are we on the way to an integration of the two? The architect's lowly map correlates useful, interchangeable and connected information spatially, to rooms, architectural compositions, building systems, and individual building components. Online, I have touched on debates about the merits of "little bim" vs. "Big BIM", the later being the highly interconnected, complex information database of sufficient magnitude to understand and manage larger issues of infrastructure. I feel humbled with the vast promise of so-called little bim alone. Just as google maps, the most accessible Geographic Information System around, has allowed us to explore a neighborhood or region, to navigate and learn, Revit enables the design professional to travel through the design while it is being created. What are the real world examples of aggregated and coordinated models like mine in use in Big BIM? I see it in sci-fi movies but tend to be skeptical that it is coming that soon. But, then again, I may be surprised some day when I zoom in real close to a building in Google Earth, and end up inside. This short essay has proved particularly popular. I sense many Building Information Modelers really see a continuity between their virtual area and the surrounding mapped virtual world around it. Right now, Revit doesn't really doesn't provide fluid links between the two. Earliest versions of the software didn't even offer coordinate information, long the pivot point in the AutoCAD world. I am realizing the connection goes two ways. 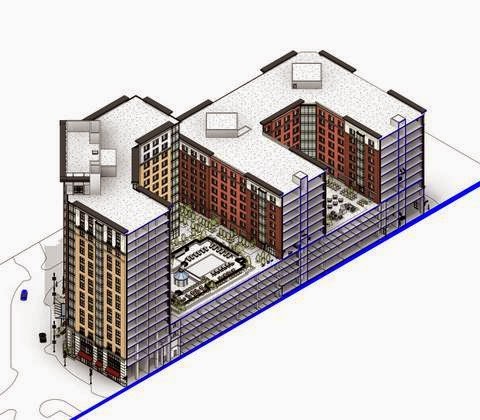 One, providing a way for the virtual building modeler to look outward to the GIS context. The other, enabling the browser of the GIS map to zoom inward and be able to access the information of individual buildings. The first is something within reach, possibly. The second presents considerable challenges.